Mt. Kilimanjaro is a dormant volcanic mountain in Tanzania. Not only is Mt. Kilimanjaro the highest mountain in Africa but is the highest free-standing mountain in the world at 19,341 feet (the Uhuru Peak/Kibo Peak). It has three volcanic cones, Kibo, Mawenzi, and Shira. 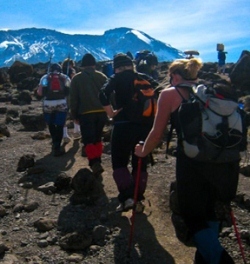 There are six official trekking routes by which to climb Mt Kilimanjaro, of which the Rongai is the easiest but with the most difficult summit night. Though the climb is technically not as challenging as when climbing the high peaks of the Himalayas or Andes, the high elevation, low temperature, and occasional high winds make this a difficult and dangerous trek. This trek is for you adventurers who want to test your stamina and have trekked at high altitude before. Reaching the summit is an exhilarating experience but for the strong at heart. End the climb with a safari to see the area’s wildlife. Mt. Kilimanjaro & Safari is for those of you who crave true adventure. You will rise around midnight, and begin your attempt to reach the summit. The first section of the trail consists of a rocky path to the Hans Meyer Cave (5150m), also a good resting spot. Descend to Horombo hut and dinner. (6 – 8 hours) This is a very long and demanding day. Tarangiri National Park is famous for its huge number of elephants, baobab trees and tree climbing lions. Visitors to the park can expect to also see zebra and wildebeest. Other animals include waterbuck, giraffe, and olive baboons. The Ngorongoro Conservation Area (NCA) is a UNESCO World Heritage Site west of Arusha in the Crater Highlands area of Tanzania. Its known for its concentration of wild life. A population of approximately 25,000 large animals live in the crater. Large animals in the crater include the black rhinoceros and the hippopotamus There also are wildebeest, zebra, the eland, and Grant’s and Thompson’s gazelles. The crater has the densest known population of lions. On the crater rim are leopards, elephants, mountain reedbuck, and buffalo. In the middle of the crater there is a large lake inhabited by hundreds of flamingoes and from a distance, they appear as a pink border of the lake. After breakfast, drive back to Arusha – Lunch – late afternoon transfer to day room at KIA Lodge – transfer to JRO for departure flight.